Our friends at Amberley have been kind enough to run a special promotion for Medievalists readers. Until November 30th, 2016 Medievalists.net readers get 20% off all Amberley titles! Just head over to their website, select your title and when checking out, use the code: Medieval16. King Cnut and the Viking Conquest of England 1016 has been released to coincide with the 1,000 year anniversary since Cnut’s conquest of England. The book is also available in Kindle, Kobo, and iBook formats. Read a snippet from this hot new release! The Viking Conquest of England in 1016 – a far tougher and brutal campaign than The Norman Conquest exactly half a century later – saw two great warriors, the Danish prince Cnut, and his equally ruthless English opponent, King Edmund Ironside fight an epic campaign. Cnut sailed in 200 longboats landing first in September 1015 on the Wessex coast with 10,000 soldiers and the two forces fought each other to the point of exhaustion for the next fourteen months. It was a war of terrifying violence that scarred much of England, from the Humber to Cornwall. It saw an epic siege of the great walls of London and bruising set-piece battles at Penselwood, Otford, and the conclusive Danish victory at Assandun on 18 October 1016. 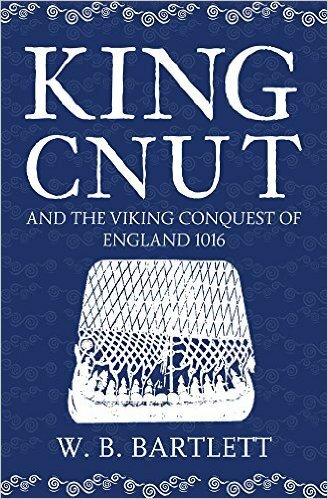 Edmund’s death soon after finally resolved a brutal, bloody conflict making Cnut the de facto king of England.This book tells the extraordinary story of Cnut the Great’s life. Cnut was farremoved from the archetypal pagan Viking being a staunch protector of the Christian Church and a man who would also become Emperor of the North asking of Denmark and Norway. His wife, Emma of Normandy, was a remarkable woman who would outlive the two kings of England that shemarried. His son Harthacnut would be the third and last Danish king of England, the greatness of his dynasty did not long survive his death. This saga also features the incompetent Ethelred the Unready, the ferocious Sweyn Forkbeard and the treacherous Eadric Streona, recreating one of the great stories of Dark Age England. Viking hordes of earlier times had probably numbered in the hundreds rather than the thousands. Now, though, things were very different; it was said that Cnut sailed to England with a fleet of approximately 200 ships, which suggests a sizeable force maybe approaching 10,000 strong if these figures are accurate. With the quisling Eadric now at his side, Cnut moved north with a powerful mounted army and fell on Cricklade in Mercia. His army then made its way into Warwickshire, burning and killing as they went. It was signifcant that Cnut’s first targets in England were Wessex and then parts of Mercia. These were the most important parts of Anglo-Saxon England other than London. In so doing he was throwing down a gauntlet, threatening the ruling dynasty in its very heartlands. If he succeeded in conquering these areas, there would be few places for the Anglo-Saxon monarchy to run to other than back overseas. Eadric’s presence with Cnut was significant as the areas pillaged in Mercia bordered on his own territory, the main base of his closest rivals. Personal advantages beckoned and they clearly took precedence over the national interest. This time there was no King Æthelred on the scene to cobble together an army to fight against Cnut and instead it was left to his eldest surviving son Edmund to lead the defence. He lost little time in getting an army together in response. But the English would do nothing without the king and they also insisted on the help of the garrison in London. Again the English defensive effort came to nothing and the army that had gathered to face up to the Viking threat stood idle, leaving the invaders to their own devices. Once again, internal divisions threatened to completely emasculate the defence of England. The situation could not go on like this. Even the English now began to realise that some kind of unified response was vital. Edmund managed to add more men to his army and sent urgent messages to his father in London to come to his assistance with all haste. Soon after, the king gave orders that the army was to reassemble after Epiphany, 6 January. Æthelred made his way from London to join the force but in the end it was all the same as before; this force achieved nothing. Once more treachery in the ranks of the army was suspected. Again Æthelred was betrayed and he returned ignominiously to London which, through many disasters, seems on the whole to have stayed loyal to the ruling Anglo-Saxon dynasty in England. It was a feeble effort and Edmund took himself off to the north where he joined forces with Earl Uhtred of Northumbria whilst Æthelred stood down his own men. Edmund could clearly not place any reliance on assistance from his father, who was by now probably both ground down by the exertions of a long and troubled life and reign and also physically very ill. There was strong evidence too that relations between father and son were not close either and that neither man trusted each other. The expectation now was that the forces Edmund and Uhtred would assemble in the north would form a united front against Cnut and his Viking army but instead they made a less direct attack by raiding into Staffordshire, Shrewsbury and Chester as well as Leicestershire as the men of those regions had refused to take up arms against the Danes. It was certainly significant that some of these were lands closely associated with the despised Eadric Streona. Divided loyalties were again tearing the defences of England apart. The uncertainty of the times was evidenced by Uhtred’s changes of allegiance. He had been married into the English royal family and had then sided with Sweyn Forkbeard. But it is quite possible that some of those mutilated by Cnut when he fled England were kinsfolk of Uhtred as it is known that he was forced to hand over hostages at the time of his submission to the Danes. As a result, he was hardly likely to be a friend of Cnut now. W. B. Bartlett has written ten history books including MONGOLS: From Genghis Khan To Tamerlane , Assassins: The Story of Medieval Islam’s Secret Sect , and Agincourt Henry V, the Man at Arms & the Archer . He works as a finance management consultant advising nations such as Mongolia and Sudan on behalf of the IMF and World Bank and lives in Bournemouth.